Power Rangers Samurai is a children's show which builds on the lives and adventures of the characters, which have appeared in many other seasons of the show's original incantation. This series features a group a strong fighters who can morph in Rangers. When they have completed their special training and learn to morph, they also achieve the ability to use special powers and weapons while they are in their Ranger forms. In Power Rangers Samurai, the group consists of six original Rangers. Jayden is the Red Samurai Ranger, the leader of the group. He is a bit aloof with the other Rangers. Kevin is the Blue Samurai Ranger, and is also second in command to Jaden. Mia is the Pink Samurai Ranger. She takes care of the team by cooking for them and keeping them together emotionally. The Green Samurai Ranger is Mike, who can be lazy but is also very creative at solving problems. The Yellow Ranger, Emily, is the youngest of the group. The other rangers must work to protect her as she grows into her powers. The group is rounded out by Antonio, the Gold Samurai Ranger. Together, the group of Samurai Rangers must work to defeat Master Xandred. Master Xandred commands an army of evil creatures called Nighloks, and uses them to attempt to complete his plan of releasing the waters of the Sanzu River, flooding the world and destroying civilization. 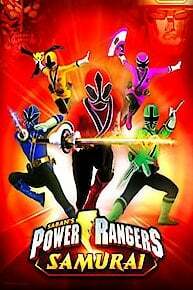 As the group of Rangers grows stronger, however, secrets are revealed that could threaten their strength. The group must learn to trust and rely on each other in order to successfully achieve their goals and destroy Master Xandred and his terrible army. Master Xandred takes his last stand against the rangers. Jayden returns to the rangers just when Master Xandred returns to try and defeat them. The last battle between Jayden & Decker. Jayden feels as if he has let his team down. It seems as if the Rangers are in a series of horror movies. A new challenge comes along just as the Rangers are recovering from their previous battle. Serrator begins and ultimate battle. Jayden fights Deker, and it's his confidence that really takes a blow. The Green and Blue Rangers get stuck, when they are fooled by Epoxor. Spike decides to runaway to find his destiny. Kevin loses his Samuraizer in battle. He goes back to his life as an Olympic swimmer, but he must choose which life he wants to live. Mia's brother comes to visit and it's a rock n' roll party. The Bullzord is released from it hiding place and the Rangers have to fight. Antonio and Mentor get kidnapped by a Nighlok and Octoroo. A nasty Nighlok turns some of the Rangers into objects. The Rangers have to face a hard shelled Nighlok. The Power Rangers Samurai take it to the next level with an all new season. Twas the night before Christmas and all through the Shiba House the teens reflect on their first year together as a team and as friends, followed by a snowy Christmas morning that brings them an unexpected lesson about the true spirit of the holidays. Halloween is every Nighlok's favorite day of the year so the creepiest creatures from the Netherworld are just dying to get into the scariest party ever and trade war stories about their battles with the Samurai Power Rangers. As the teens continue their transition into their new secret lives as Samurai Rangers, Emily reveals a surprising truth about herself. When a Nighlok attacks, the Rangers combine their Zords to create the Samurai Megazord in order to defeat the monster. As invasions from the Netherworld increase, the Red Ranger unites a new team of Samurai Rangers to meet the rising threat. The Rangers try to finish off the dream monster Rhinosnorus while Jayden and Deker finally face off in their ultimate duel. When the Gold and Pink Ranger fall under the spell of a dream-inducing Nighlok, the other Rangers must enter the Dream World to save them. With Jayden kidnapped by Deker, the other Rangers must summon the strength to fight a mutant Nighlok without their leader. Jayden is poisoned by Octoroo during his attempt to discover the Red Ranger's sealing symbol, which can lock away Master Xandred forever. The Rangers must defeat the evil Splitface who steals people's spirits including the Yellow Rangers before the fall into an eternal sleep. As Antonio attempts to gain Kevin's respect as a true Samurai, Octoroo devises a plan to create a stronger portal between the Netherworld and Earth via a secret ancient well. Jayden's childhood friend and self-made Samurai Antonio struggles to be accepted by the team as the Gold Ranger. A traveling fisherman named Antonio arrives and claims to be the sixth Samurai Ranger. Jayden leaves the Shiba house hoping to keep the other Rangers out of harm's way, but when a powerful Nighlok attacks, Jayden finally accepts the fact that he needs his team to fulfill his role as the leader of the Samurai Rangers. A Nighlok is sent to stop the Red Ranger from using his special power to seal Master Xandred in the Netherworld forever, but their duel is interrupted by the mysterious Deker. A Nighlok uses mind control powers to force Kevin to fight against his fellow Rangers. Kevin is assigned the crucial task of catching the elusive SwordfishZord in order to save the other Rangers who have been incapacitated by the stench of the Nighlok Yamiror's breath. When a Nighlok who uses insults as a physical weapon attacks the Rangers, only Emily is unaffected. To help her teammates, she explains how difficult events in life become an opportunity to grow stronger. Power Rangers Samurai is currently available to watch and stream on Saban. You can also buy, rent Power Rangers Samurai on demand at Amazon, Netflix, Vudu online.